Monday 9th - Saturday 14th October, it’s National Libraries Week! So we wanted to give a shout out to our famous Coventry University Lanchester Library, including the top 10 facts you NEED to know about your library! Discover the genius of Frederick Lanchester, and see the scope of his interest and inventions on the second floor of the library!! Frederick Lanchester in 1894 built the first motorised engine but, because of strict laws, he was not able to test it on the road which led him to test the motor in the sea. Instead of building a motor for a car, he built the very first motorboat! The Lanchester cars were driven by the rich and famous, Rolls Royce were also a major competitor to them, but did you know that even King George V drove a Lanchester, and our very own Queen Elizabeth II made her first public appearance in one!? Lanchester Library officially opened in September 2000 and cost a mega £19m to build! 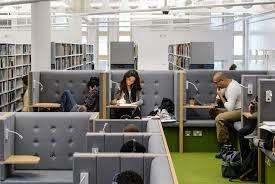 In total there are 1300 study spaces – and will very soon hold a whopping 1400 – have you found your favourite study space in the library yet? This is one of ours! Need to get that group work completed but can’t find a room? There are actually 9 group rooms bookable online and 3 project rooms available on a “turn up and use” basis - just log into Locate. If you’re off campus and working from home – there are 130,000 eBooks and 86,000 eJournals (each containing millions of articles!) Plus 350,000 printed books (yes, real books!). Our Lanchester Library is the largest deep-plan naturally ventilated building in Europe with a massive floor area of 10,000m2! Its more than just a building – its sustainable infrastructure and resourceful energy! And finally – our city library, in the centre of Coventry, will be hosting a digital expo on Saturday 21st October, a technological extravaganza with a range of workshops and demonstrations including lego robotics, family history sessions, code clubs and much more! For more information, please visit the website. For more info about what’s happening at your local library visit www.coventry.gov.uk/whatsonlibraries or pop in to a library near you! So now you know more about Lanchester Library, you can connect online! Chocoholics Unite! World Chocolate Day 2016. Inspired, The Office of Teaching & Learning, Why Cov Uni?